It’s around 9:00 pm on January 29th 2014 and I am staring at blank sheet of notebook paper sitting on my lap. I’ve been staring at it for what it seems like a freakin lifetime and it’s starting to feel like pulling my hair out is better than sitting here and writing absolutely nothing. I take a deep breath and scribble down a few words. Nope. That doesn’t feel right. I scratch them off. Back to square one. I can’t just write whatever. This is MY life we are talking about! What if this stuff really works and I end up living a life I absolutely did not intend on living!? Okay, I don’t even know what I am saying now. This is my queue it’s time for bed. The next morning I wake up and immediately grab my notebook off the messy pile of books on my nightstand, squinting with one eye while the other one still shut from last night’s sleep, I begin writing fearlessly. Before I know it, I’ve chicken scratched over four full pages. Victory is mine! Man this feels good. I got lost in a sea of flow. It was pure magic. I had never felt more creative and energetic while writing (except when writing my blog posts of course). Then it hits me… what in the world did I write anyway? 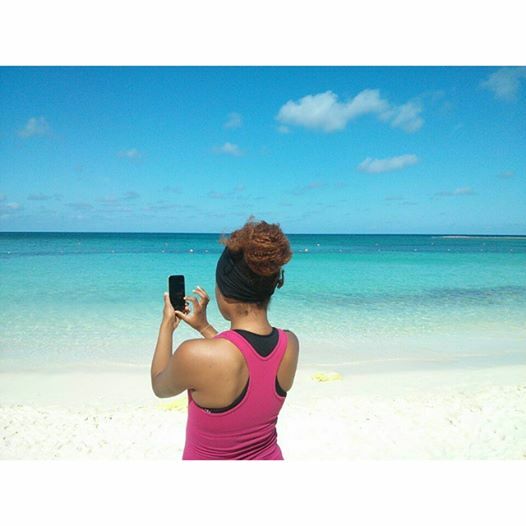 A day earlier I had returned from Barbados (birthday treat courtesy of my love) and apparently I was still on a Caribbean high because the Perfect Day assignment I was writing for started with me sitting on a Caribbean beach working on my laptop. I wrote about this exact perfect day, every day for weeks. I had fallen in so love with my first trip to the Caribbean that when the life coach I hired three weeks earlier asked me to write about my perfect day (and after a mini freak out) I knew that my perfect day consisted me sitting beach surrounded by nature’s beauty, living with the happiest people I’ve ever met, and of course, writing blog posts or brainstorming new speech content. Fast-forward to today, I am currently sitting on a Caribbean beach in the Bahamas surrounded by nature’s beauty, living alongside some of the happiest people I’ve ever met, and writing this story to you. Coincidence? I think not. When I wrote my perfect day assignment in the beginning of the year, there was no way I knew I would actually end up in the exact spot I had requested. The stars did not seem aligned to manifest any part of my perfect day. Yet, the Universe delivered. As I look back on how this giant request was processed and with a little bit of Deepak’s help I realized exactly how many of my desires have been granted with just a few simple emotions. Want to experience your Perfect Day? Stay tuned for the next post to learn how you too can manifest your Perfect Day. This is amazing. The law of attraction is so real!! Yep… The law of attraction is just as real as the Law of Gravity.